Here’s her illustration of Cover Flow, a choice in the Finder that shows you a chosen document page by page so you can tell if it is the one you want to open or send to another person. 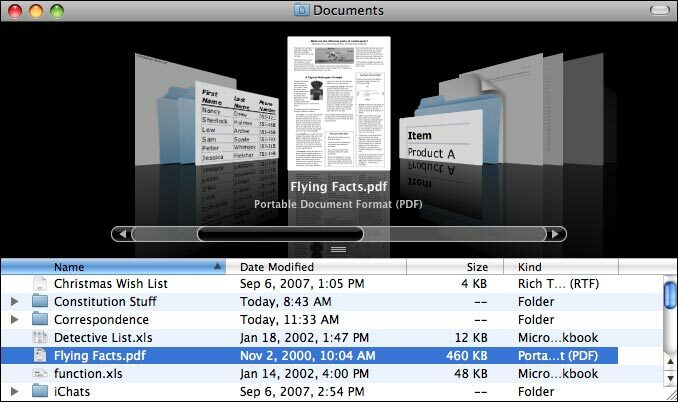 You can also use it to review quickly the first page of each document in an entire folder. Cover Flow did not work when I tried it on an Excel doc (let’s blame Microsoft for that) but another of Leopard’s file previewing options, Quick Look, reportedly does work on Excel files. The Cover Flow view here is reduced in size; it can be made so that the print is pretty legible, by enlarging the finder window. And, she offers even more with a link to Apple’s page listing 300 new features in Leopard. On that page the items are organized alphabetically by category (AddressBook, AppleScript, etc.). There are useful additions in many categories, so scroll through them all. Universal Access shows a continuation of the concern Apple has long had, for adapting the system for use by people with visual or other limitations. There are Braille features, special navigation by key rather than mouse, and more. Some are valuable additions for anybody. For a long time I have used my Mac to read things to me, like articles or Project Gutenberg texts, while I do something else, and I was pleased to see a listing about the new voice that has been added to speak text (“Alex — A New Voice. Meet Alex, an English male voice that uses advanced, patented Apple technologies to deliver natural breathing and intonation, even at fast speaking rates.”) This voice is a big improvement over previous choices, though those are still available too. In addition, you can now set the Speech Preferences to have spelling mistakes indicated by a tone or description, as well as having punctuation indicated and much more (go to System Preferences > Speech > Universal Access > Voiceover Utility and set preferences there). Under the Safari section I found “Pull Tab into New Window. Separate a tab into its own window with a simple drag and drop.” I usually have half a dozen windows open with multiple tabs in each, and then when a tab turns into a Google search, from which I want to open a whole new set of tabs, I want to start anew with a window devoted to the search-related tabs. This feature is just what I was wishing for. “Full History Search. Easily find web pages you have visited. Safari indexes all of the text in websites that you browse. Even weeks later, Safari will be able to find a web page that matches your search.” The amount of History that Safari keeps is set by the user in Safari Prefs and ranges from a day to a year, or until you clear it manually. “Desktop Picture. Turn any photo you find on the web into your desktop picture with one click.” It’s also possible to make collages and mosaics for your desktop from iPhoto albums or screen saver photo collections (see the Screen Saver section). This may not be exactly useful but it sounds fun. The section on new Security features makes reassuring, if not exactly fascinating, reading. And more details are available through a pdf link in this section. Even if you’ve been using Leopard for years, I’ll wager that you will find something new to you in this Apple list. The earliest record we have of a connection between the title ‘academy’ and fine art is the inscription ‘Academia Leonardi Vini’ which appears on six Renaissance engravings, including the complicated knot roundel in the British Museum. The inscription may not refer to an art academy, but to an intellectual circle which met in Milan. Ludwig Goldscheider suggests that the engravings were admission or prize tickets for scientific disputations. Oh to have been a fly on the wall at one of those gatherings! This entry was posted in mac, things that work and tagged Apple, Leonardo da Vinci, Leopard by nosleepingdog. Bookmark the permalink.